I find your apparent paranoia rather frustrating, phillips, but I will try to hep you as best as I can. For some reason, none of the people here have given you the information you actually need. Spring is an engine with multiple games and multiple lobbies. Evolution RTS usually uses weblobby. When you download it, you are accessing the lobby, not the game itself. Once you log into the lobby, the moment you join a multiplayer game, the lobby will download all needed game versions, maps, and engine versions. This make the updating process very fluid and more of a user hands off approach. Evolution RTS (And practically every other game) uses an update system called "rapid". Rapid takes your latest downloaded game version, and compares it to what has changed in the latest version, and only downloads the parts that have changed. So instead of a 6gb patch blizzard style, you end up with updates that are little more than a few mb. That said, if you didn't get past the TOS, then that would be the largest issue. I understand the concern about it, and yes it's helpful to notify us of it, but if we really wanted to do something nefarious to you, do you really think all of our sources would be on github and do you really think that we would try to use a TOS to screw you over? That's what I mean wrt paranoia. A healthy dose of paranoia isn't a bad thing, but it helps to direct it to the areas that make the most sense (like is this game downloading a script that will take nudes of my dog and send them to my cat??? ), and in a project such as this where the source is very visible and very public, it doesn't really make sense to hone in on a TOS (but thanks for the heads up that it's 15 different types of screwed up in that dialog!). I don't usually check this forum. I have a google alert set up for "Evolution RTS", which is why I saw this one (I never bothered subbing to the forum). If you need me directly, the steam forums are your best bet, either those or the lobby, but I have been out of town for almost a month so my presence has been pretty sparse. Usually everyone gets together to play a bunch of games sometime around 5pmGMT on saturdays. Usually people jump on mumble as well. You're welcome to join! I don't usually check this forum. http://www.evolutionrts.info/download/ reads "Need help installing? Post on the forums! http://www.forums.evolutionrts.info" and http://www.forums.evolutionrts.info then redirects to this springrts.com forum. Thanks for all the help people (Including/especially abma). Game failed to load, again with the "Illegal instruction" error. Edit2: MD5 is no longer considered crypotgraphically secure. "Never use shaders when rendering SM3 maps"
Last edited by phillipsjk on 18 Jul 2014, 17:09, edited 2 times in total. I agree with the OP about the TOS. Why not remove some crap from it, make it fit on one screen? I'm notr sure I've read it either, they all contain the same crap and knowing basic netiquette is usually enough. If nobody reads it, why bother having it there? Those kind of disclaimer are still not legally valid, for many reasons. One is that the person installing the program is not always the person that has the authority for making those kind of agreements in the name of the corporation that installs it. Ok, maybe more valid for corporate environments. But you know what I mean. If you follow the link in knorke's last post, you will see that it was fixed in the last two hours. It will fit on one screen now. The Terms are helpful in telling the user what to expect from the mods. They caution that everything is logged (to enable stuff like replays). While not necessarily legally binding, it is still information I would like to know. Yeah, of course the useful part is good to have. Just the crap could be removed. And it apparently is now. I updated this post with the infolog after a failed launch. I am not sure if I should find a better forum section like Help & Bugs, or Linux. I am using the Debian build, which is not exactly the same as the static build on the download page. Look around in weblobby settings, somewhere is a "use safemode" option, check that. Should that work then uncheck it again and go to http://springrts.com/wiki/Springsettings.cfg to maybe re-enable some things. Looks bit like problem with graphic card/gfx drivers, try different ones. Yes, Linux subforum looks ok at this point.. Very many errors in that infolog, most of which are likely not your fault. The graphics cards errors alone look like game over unless you can discover some combination of disabling gfx settings that allows your gfx card/drivers to handle spring. Run spring with --safemode and see if you can load successfully then. Silentwings wrote: Very many errors in that infolog, most of which are likely not your fault. I just want to point out that those errors aren't actually errors either. It's just warning stuff that is baked into post to warn when values differ (but default values are set in their place). It's actually extremely useful and can help solve a lot of irritations and problems. You guys should do this in BAR (Smoth is the architect behind most of it, so you could probably get him to help you with it). The radar yardmap is an exception, but mainly just me being lazy/forgetful but doesn't actually effect anything. And the shield weapondef stuff is kept for backwards compatibility,although I doubt the rest of the game is that far backwards compatible at this point so I probably should remove them, just because. I just want to point out that those errors aren't actually errors either. I don't want to rub your nose in it, but they are errors (at least to my eyes) and probably also to someone who knows nothing about what the messages mean. It's true that there are some bits which look like debug print, but there are also (engine generated) warnings/errors about missing/conflicting movedef tags, missing weapondef tags, missing featuredefs & an incorrectly sized yardmap - of course you might have reasons for wanting all these kept. You guys should do this in BAR (Smoth is the architect behind most of it, so you could probably get him to help you with it). Somehwat offtopic, but BAR is not currently available any any purposes other than testing and, if you'd looked, we have for years included a small amount of debug printing for some gfx related questions. Last edited by Silentwings on 19 Jul 2014, 10:10, edited 2 times in total. Next time you "don't want to rub my nose in it", don't. I'm pretty well aware of what is going on and if they were consequential, I would do something about them. Moreover, the missing ceg stuff is caused apparently because the engine gets confused about weapons folder vs weapondefs in unitdefs. There are some warnings about wrong tags used in some old cegs. They don't cause issues and are therefore inconsequential (if not slightly annoying). But thanks for not "rubbing my nose in it". My concern is to help this guy isolate which parts of the infolog errors/warnings are actually related to his issue. If you want to keep your errors/warnings/debug stuff, it's no concern of mine! There are no binary dependencies supplied with EvoRTS. Are you talking about weblobby or spring? did those get pulled from the wiki? because those are pretty incorrect. smoth wrote: did those get pulled from the wiki? because those are pretty incorrect. Of course. A direct copy pasta. The engine presents a constantly moving spec target, and those were copy and pasted probably years ago. 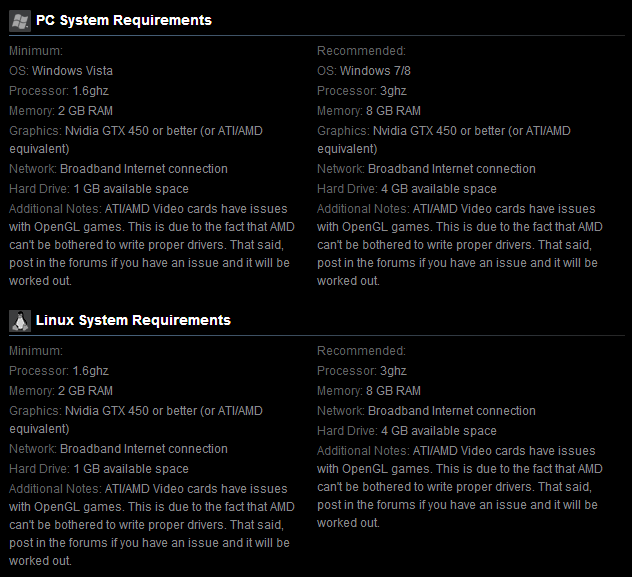 The engine probably could run a game on that but your project has significantly higher requirements. the engine minimum could be that reasonably but your project is not doing the engine minimum.